I love looking at these 2 images together, possibly because of the similarity of their respective "palettes". Besides. It's a fair excuse for some blatant beautiful-ness! And that gallery wall? Bang on. Gallery walls are the bomb. I'm stalking out the best spot for one in our new house at the moment! That first room is absolutely stunning! 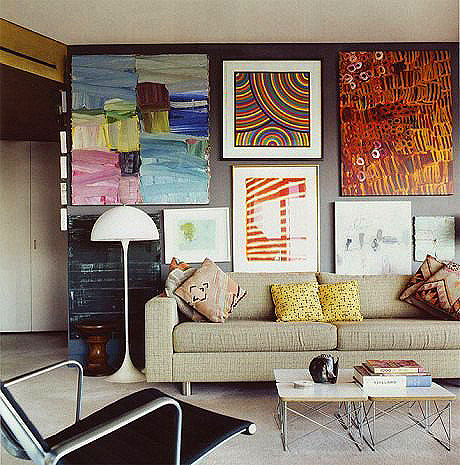 That is a stunning gallery wall - the floor lamp is the perfect pop! The gallery wall is stunning! Colorful arts against dark walls is totally my style! She rocks those brows for sure. Increasingly individuals are adopting this strategy which they're acquiring incredibly straightforward to practice. can be aware of it. So that's why this post is outstdanding. Thanks! I hardly leave comments, however i did some searching and wound up here "When beauty and decor collide". And I actually do have 2 questions for you if it's allright. Is it simply me or does it give the impression like some of these responses come across like they are written by brain dead folks? :-P And, if you are posting on additional sites, I would like to keep up with anything new you have to post. Could you make a list of all of your community sites like your twitter feed, Facebook page or linkedin profile? dead people? :-P And, if you are writing on other online social sites, I'd like to follow everything fresh you have to post. Would you make a list of the complete urls of your public pages like your twitter feed, Facebook page or linkedin profile? simple, yet effective. A lot of times it's hard to get that "perfect balance" between user friendliness and visual appearance. I must say you have done a great job with this. In addition, the blog loads super quick for me on Firefox. Superb Blog! This great article has truly peaked my interest. I'm going to book mark your website and keep checking for new information about once per week. I opted in for your RSS feed as well.